Mǝdium Tǝdium: #### — ? 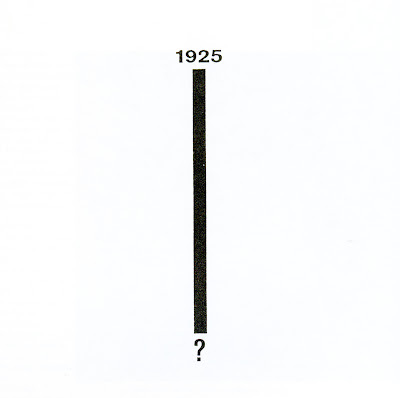 I was going through some of my books over the weekend, and found a catalogue from a Dada exhibition called 'The Avant Garde Book: 1900-1945', My favourite image in it is by El Lizzitsky from a book called Die Kunstismen. Lissistzky collaborated on this book with Jean Arp. It's interesting to think about how different perspectives on the future were in 1925 compared to today. Granted the image suggests an indefinite future - it could be 1926 or on the other hand, the year 2525 - but I read a sense of wonder and optimism and yet a weary dubiousness of the inevitability of what is to come. I was talking to a friend about Boccioni's Unique Forms of Continuity in Space (1913) and we were saying that (as the work is all about speed) to us it doesn't seem to be moving all that fast. In fact, it's kinda trudging.